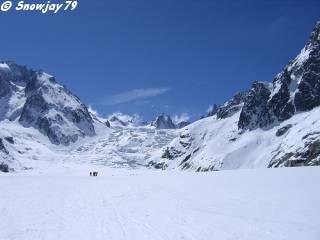 Okay you've found this page and want to know about skiing the Vallée Blanche (White Valley). You've heard it is the run to do at the end of your week in Chamonix and is not that hard but are havering between booking a guide or chancing it with your mates. The Vallée Blanche or VB is a 17km route that starts at 3812 meters on the Aiguille du Midi and finishes either at the Montenvers mountain rail terminus or in Chamonix itself depending on the conditions. This can give you around 2,800 meters vertical in the amazing scenery of the Mont Blanc range. It is best skied mid-week rather than on a Friday when it is a favourite fin de semaine excursion. You can do a number of VBs in a day but most people will content themselves with a single descent. Lets talk about guides first. A general rule is that if you have doubts about your ability and what equipment you need to ski the VB you should seriously consider skiing with a guide. Despite its reputation as 'something between a blue and red piste' it should not be forgotten that the Vallée Blanche is a high mountain off piste route with all that entails. I've only skied the VB without a guide, but if I was in a group where I was not sure of the abilities of the others, or my ability to assist them in case of danger I would not hesitate to ski with a guide. This is not a macho thing but common sense. This page will give you an idea of the difficulty and problems that you may encounter so that you are better informed to decide how you ski the Vallée Blanche. 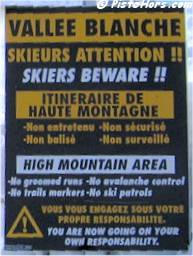 I first skied the voie normale (normal route) in 1993 with my mate Steve Hinde. Steve has a lot of ice climbing experience and took care of the basic safety aspects so we were self sufficient. Now, with greater experience I would do some stuff differently. I've written these notes with safety uppermost in my mind. They should get you from top to bottom provided you have a modicum of common sense, can ski well and the conditions are good. I've known some very inexperienced people ski the VB but some have had nasty scrapes along the way. A couple of friends, with only a few weeks skiing between them attempted it very late one winter's day. After some effort they made it down from the cable car station to where you usually start skiing, at this point one of them collapsed with a heart murmur, his partner didn't feel confident to get back up the ridge in his ski boots. Luckily the last cable car of the day brought a French guy and the two young ladies he was hoping to accompany down. In a gesture of friendship he let the girls ski on ahead (they were experienced skiers) and went up to the cable car station to summon help, before abandoning his skiing for that day and returning to the town in the cable car. The helicopter arrived and took both my friends down where one of them spent the night in hospital with an irregular heart beat and the early stages of hypothermia. The bill for this little adventure was around 1000 Euros back in 1994 - expect to pay more today! You will not need a guide to go on the cable car, there is normally a reservation system although you can just turn up and get on. Inquire when you are in resort as it is better to go early in the day for a multitude of reasons, rather than late. You climb 2800 meters tres rapidos so I suggest taking break for a coffee a the Aiguille du Midi before attempting the arête. Before you put your skis on their is the famous arête from the cable car station which needs to be negotiated. Judging by the number of deaths this is probably the most dangerous section of the route, especially for those who will follow the voie normale. People fall off this ridge and die each and every year. On one side you basically end up somewhere near Chamonix 2000 meters below. Although both faces have been skied it is around 40 degrees pitch so once you slide it is goodnight Vienna. In season there is a safety rope which is nice but there is also a long string of skiers in slippery slidey ski boots making their way slowly down the slope. Without the rope it is quite airy! Personally I would take a pair of crampons, useful too if you have to make a crevasse rescue. I also wore a climbing harness and clipped to the rope on my first descent. A guide might well rope up his clients and wear a harness and crampons himself. As basic kit for a group I would suggest the following personal kit: a climbing harness, a 2 meter sling, a self blocking pulley (Petzl Mini traxion, a small emergency ascender (Petzl Tibloc), two screwgate karabiners and an ice screw. The group should also have a pair of 30 meter 8mm short climbing ropes and a couple of prussik loops. Each person should also attach a a 60cm free length of 9-10mm cord to their harness with a figure of 8 climbing knot with a screw gate karabiner on the other end. This makes external crevasse rescue easier and can be used to secure you using the ice screw to the wall of a crevasse. You will need to know how to use all this gear too... both for self and external crevasse rescue. Did I mention something about hiring a guide already? Crampons are useful as I have said. No matter how warm it is wear a waterproof ski gear, if you fall into a crevasse it is very very cold and people die of hypothermia waiting to be rescued. Don't forget high factor sun cream or block and glacier glasses and goggles in the rucksack in case the weather closes in. I would also suggest carrying one or two survival blankets or bivvy bags between the group. An avalanche transceiver, probe and shovel are less useful if you are only skiing the voie normale as the avalanche danger under normal conditions is slim. There have been serious avalanches on the alternative descents. Even if you stop at the refuge for lunch try and take thermos and some choccy and maybe glucose tablets. A GPS might be nice in bad weather, but I'm not sure I would ski the route in marginal conditions as the scenery is a large part of the trip and wide, flat crevassed valleys are difficult to navigate safely. I would also note the rescue services (PGHM) number in my mobile phone, assuming you can get a signal. There is a phone at the Requins refuge as well. If you ski with a guide he will carry a walkie talkie relayed to the valley. Some people have contacted me questioning this set-up. You have to appreciate that after the summit ridge the biggest danger you will face is falling into a crevasse. If you are not skiing with a guide you need to have the gear to get someone out. Skis can be used to form a dead-man anchor - either stuck vertically in a cross formation into the snow or buried to form a T with the sling and climbing rope. A rucksack can also be buried in hard snow in order to secure a rope. An ice screw is a useful belay device in ice. You don't need a hammer to place a screw, they have teeth on them that cut into the ice, the screw itself is hollow which reduces the amount of effort required. Placement is important as the weight a climber puts on the screw results in enough pressure to melt the surrounding ice. Of course people ski in jeans and jumper and a pair of Bolley sun glasses and nothing else bar a credit card and live but they also fall into crevasses and die or get badly injured. As I said, avalanche risk on the route is not that high but do not stop for a picnic beneath the Seracs (I think the area is called something like the 'le salle a manger' but don't be fooled). These can fall at any time but tend to break away as the day warms up and fall and crush people to death! Some of the alternative routes are even more threatened by these seracs. Indeed a basic rule of glacier travel is to never remove skis or snowboard as this puts extra load on snow bridges. At most you can free one foot. Snowboarders should carry collapsible poles to push over any flat sections of the route. On a cold, late November day in 1955 Louis Lachenal, the first man to stand on the summit of an 8000 meter peak, was casting about Chamonix for a partner to ski with him on the Vallée Blanche. 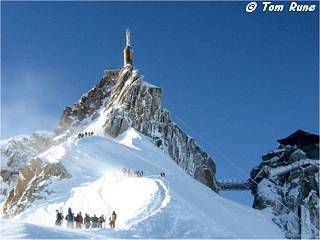 He met up with experienced guide Jean-Pierre Payot and they took the cable car to the Aiguille du Midi. Payot recalls the day "we skied a steep couloir to reach the start of the Vallée Blanche, chatting calmly to each other. It was quite cold and the wind was getting up. We arrived at the first seracs, the wind was directly in our faces, we didn't have glasses back then and we were skiing unroped. Louis commented that the strong wind was dangerous. I was barely 2 meters ahead. I hardly had time to turn when I heard his aluminium skis scrape across the ice as he fell into the crevasse." Louis Lachenal had broken through a snow bridge, 25 meters below the back of his head struck a block of ice and snapped his neck, he must have died instantly. Payot shouted below but there was no reply. In a supreme effort he climbed back to the cable car station which was now closed, he then climbed on to a refuge and telephoned for help. It was now 11pm and the guides in Chamonix were not keen to turn out. Only Lachenal's friends were prepared to come, although they were later joined by guides. They lit tires above the crevasse to keep warm and one of them descended to recover the body of the great alpinist. At 11am the next day they arrived back in Chamonix. Louis Lachenal is buried in Chamonix cemetery. The voie normale basically follows the valley floor. After the arête you turn towards Italy in a wide valley. The Heilbronner cable car is above your head. You can also cross to Aosta on the reopened Mt Blanc tunnel and ski from that side. People say this is an easier start for those afraid of heights. You follow the valley down onto the col du Midi, there is a big rock outcrop called le Gros Rognon to the left. You traverse right here towards the cliffs of the Mont Blanc du Tacul, avoiding any crevasses or depressions you may spot on the way. You now turn towards the north and the skiable part of the valley narrows considerably. You will see an ice fall and crevasses to the right and seracs to the left. This is the steepest part of the normal route and is often very busy as the other routes rejoin at this point. You have to remember that you are also skiing over snow bridges, there are actually crevasses under your feet (or so Steve told me, he has passed this way numerous times in the summer). So you need to be able to ski a red piste without falling to get through this section reasonable safely. A fall can put additional pressure on the snow bridges and you can break through. Also try to keep to the existing tracks (although this is no 100% guarantee of safety) rather than heading off into virgin snow. You can keep to the left side of the valley (looking down) and traverse to the Refuge du Requin for lunch (tel 04 50 53 16 96). The refuge is situated at 2516 meters altitude and faces the séracs du Géant, the arête des Périades, le Mont Mallet , lAiguille du Tacul et la Dent du Géant. You now enter onto the Mer de Glace, a fairly flat section where you follow a track zig-zagging between the crevasses. You can see the famous Drus summits here. It also gives you a chance to study the exit of the Pas du Chevre if you are thinking of skiing this later in the week. At Montenvers you can take the train (included in the lift pass, apparently) or if the snow or legs permit ski or walk back to town. A tip here is to bring walking shoes in the ruck sack or use ski de randonee boots as this will make the wooded zig-zag path much more pleasant. The route off the glacier can be tricky and there were also some vertical iron ladders to negotiate. There are a number of alternative routes. In the above photo looking left to right are the vallée Blanche normal route, The "real" Valley Blanche, The Petit Envers du Plan and the Grand Envers du Plan. These are much more interesting ski wise but can involve some steep pitches and couloir skiing and avalanche and serac danger. They are also even more heavily crevassed. 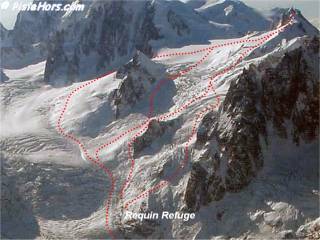 From the bottom of the arête you continue straight ahead to ski directly down to the Refuge du Requin. There is also a steep and technical couloir directly below the Requin hut which leads to the Salle a Manger. It is possible to spend the night in the Cosmiques refuge or event to camp at the base of the arête either in a tent or snow cave. This is strictly speaking illegal but seems to be tolerated for overnight bivouacs.